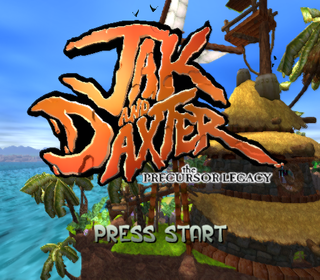 Jak and Daxter: The Precursor Legacy is the first game in the Jak and Daxter series. 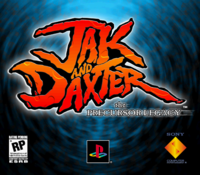 One of the first platformers for the PlayStation 2, it was revolutionary for its time. You play as a mute teenage boy teamed up with his wisecracking best friend who was accidentally turned into an otter/weasel hybrid. Text strings in the file 0COMMON.TXT which are unused. Some text strings refer to missions which were either never implemented or given different titles. Sandover Village A variation which is very similar to the music that plays in Samos' hut. Forbidden Jungle A different version of the temple theme. Misty Island Two variations of the main theme. Fire Canyon A variation of the used theme, similar to a track located in the files of the game's demo. Boggy Swamp Two variations of the main theme. Snowy Mountain A variation of the main theme. Gol and Maia's Citadel This track is technically not unused. It plays whenever Jak is next to Samos in his cage, but the only way to reach the cage involves falling past it, which doesn't give the music enough time to start playing. N/A A file titled CREDITS.MUS which contains similar music to the final boss battle theme, with three variations. 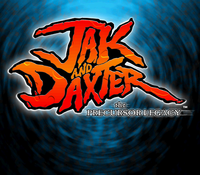 The file is also in Jak II, once again unused. 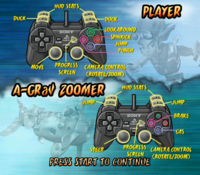 Debug mode can be accessed by entering the following button combinations during gameplay. 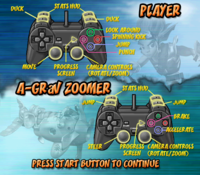 There are two parts to the full combination and if each part is entered correctly, a sound effect used in the pause screen will play. The mode can be turned off using the same combinations. R2: Jak will levitate. This also applies to the Zoomer and Flut-flut. R2 immediately after taking damage: 1 HP will be restored. This also prevents instant death, such as with Lurker sharks. L1 + R1 + L2 + R2: Turns on free camera mode, while making Jak disappear. The mode is turned off by pressing the same buttons. (using the D-Pad) Up + Left + Select: Restarts the game. If used in free camera mode, it instantly respawns all the level's objects and all inventory items are lost. L1 + R1 when on the Power Cell section of the pause screen: Unlocks the selected Power Cell if it hasn't been collected. Unlocking it won't remove it from the world and if it is collected after unlocking it, the cell counter won't increase. Text will appear on the top-left side of the screen during certain events. It usually consists of error messages such as "outside of bsp"
Only the cutscene and level immediately after Geyser Rock will load properly, all others will lead to a black screen with the audio. 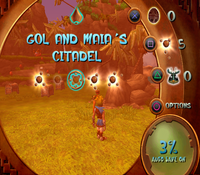 The Misty Island level does not behave as it does in the demo, for example catching the Sculptor's Muse will not immediately give the player a power cell. The boat cannot be used to return to the mainland if the player has not completed the mission "Catch 200 pounds of fish". The game is aware of a level called halfpipe, but because the level file itself is missing, attempting to load it will result in the game repeatedly trying to do so without success. There is also a checkpoint called halfpipe, which does not work for the same reason. 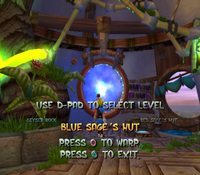 The text at the warp gate is changed from "USE D-PAD TO SELECT LEVEL" to "USE DIRECTIONAL BUTTONS TO SELECT LEVEL". 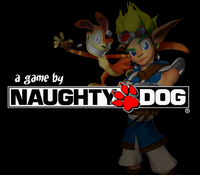 The sound when Jak falls into Dark Eco is different in the Japanese version. In the US/EU/AU versions, three audio samples are used while in the Japanese version only two of them are used. This page was last modified on 11 March 2019, at 17:11.